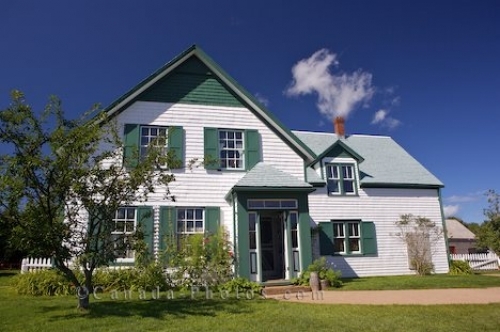 This famous heritage house is set amongst the natural beauty of Cavendish in Prince Edward Island where Lucy Maud Montgomery was inspired to write her well known book called Anne of Green Gables. The setting of her book written in 1908 was based around Green Gables and her childhood and today it is open to the public as a tourist attraction. Site of Lucy Maud Montgomery's Cavendish home, (author of Anne of Green Gables), a National Historic Site, Blue Heron Coastal Drive, Queens, Anne's Land, Prince Edward Island, Canada. Picture of a heritage house on a National Historic Site in Cavendish, Prince Edward Island where Lucy Maud Montgomery lived.